Force India’s switchover to focus on its 2017 Formula 1 development program is “not far away” following the debut of its major upgrade package at the Spanish Grand Prix. The VJM09 sported a new front wing, floor and associated bodywork, including sidepods, during the course of the Spanish Grand Prix weekend in Barcelona. Given the significant shift in design philosophy required for 2017, the challenge of balancing resources between this year’s and next year’s cars is even greater than usual. 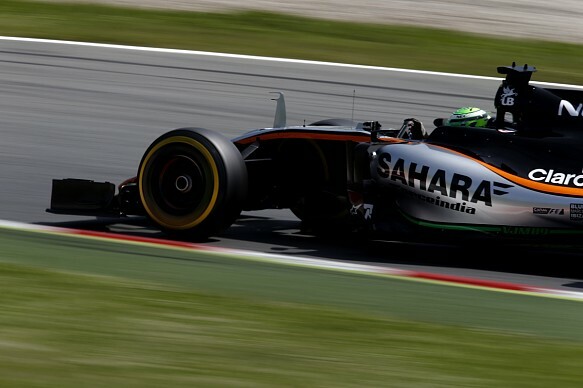 “We’re already doing some work on it now, as I’m sure everybody is,” said Force India deputy team principal Bob Fernley. “It’s just a matter of when we do the full switchover, and that is probably not far away. “We can take quite a lot out of the weekend,” Fernley added. “We’ve a little bit more work to do to get the race pace just where we want it, and hopefully we will get the data for that from this week’s test. In the end it was a faultless delivery from Checo, and there was nothing really Nico could do given the oil leak. “Of course, we lost two cars at the front [Mercedes duo Lewis Hamilton and Nico Rosberg] but we delivered a perfect race from what we could get out of the car. Overall, it [the upgrade] worked fine because it has definitely delivered. The drivers were very happy with it.